Ancient roots of the popular song. 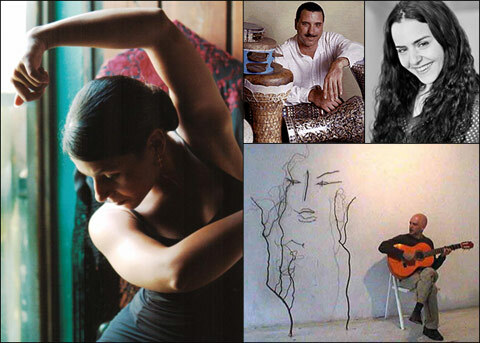 Mideastern acoustica and contemporary Andalusian dance music with poety from Medieval Spain. No CD available yet. The Spinozas take lyrics from medieval Arabic, Persian, Hebrew, and Romance poetry and combine it with original music by Dave Solider heavily influenced by the Mid East, Flamenco, and "acoustica." Rachid Halihal: Oud and violin: Fine Moroccan Instrumentalist who recently toured with Rachid Taha. Maurice Chedid: Oud and voice: New York's top oud virtuoso and one of it's best singers of the Mideastern repertoire. Paul Frazier: Bass, longtime and current bass with David Byrne and many others.